Day 147 of 365 Days of JOY! If you have been following my blog previously, you must have thought I downright lost my JOY. I have been charting my course through 365 Days of JOY and sharing what brings me JOY as I am able. But the last 6 weeks or so, my JOY tracking has lacked. On ministry teams at our church we often talk in planning meetings about the importance of not forgetting the JOY factor in leading and facilitating ministry. Can you relate? Does ministry or a task God has given you often weigh so heavy on you that you loose the JOY factor in it all? The JOY I share with you today has taken many twists and turns on quite a long journey to reach the point of reclaiming the JOY factor – to say the very least. But then again, God often takes me on a long walk to teach me all He wants me to learn. I’m a slow study. But when I get it…it’s deep within me. As I set this banner out for all to see, it brings me more JOY than words could describe. I have witness epidemic spiritual hunger and thirst for real relationship between women of all generations. I have been blessed to watch as many women, some for the first time, risk jumping off the edge of a cliff into the unknown of sharing relationship with a woman outside her own life season. It is with great JOY I long to journey with these women helping them to understand the value of mentoring / discipleship relationships and equipping them with all the Lord has taught me along the way. Releasing them to the beauty of bonding between women that invites the work of God to impact both of their lives. If you have arrived at this page by way of the bird – Twitter – that is, you have come straight to the new home of my previous blog. Please browse the pages to see what speaks to YOUR heart. Subscribe and come back often. (Follow button on bottom right). I want to hear your heart as well. And many other women feel the same, I am certain. Share what only you can share. When you are finished on the blog pages, scroll to the bottom of this page to take you to the Home Page of Ruth’s Hope to find out more about Real Women. Real Life. Real God. As a child I loved to check the mail. A letter from my Mom who lived in another state was such a treat to a grade school girl. 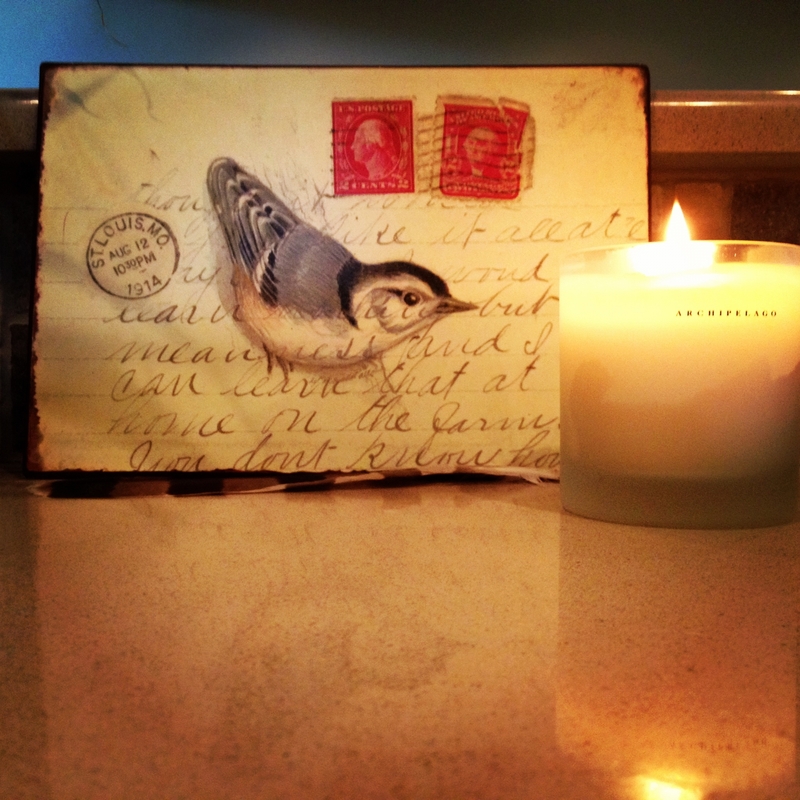 The bird and postage stamp. The candle. Warmth of home. A familiar scent welcoming you. Day 120 of 365 Days of JOY. At peace today in the quietness of the place I call home. Peace only my Father can provide. What brings you a simple childlike JOY? I have wanted a pair of TOMS forever. For each pair you buy a pair is bought for a child who needs shoes. Many styles to choose from. Many children to put shoes on! Something about this just blows my mind. Rich. Detailed. Perfection. Handiwork of the Creator. Who says rain is not a beautiful thing? Who says? Forgive me Lord for the times I whine about the rain. Your creation is praising you! I want to join in. I am at peace and full of JOY today. Though i am tired from a long day, I am grateful that my son lives close enough to us that we can be in the middle of stripping wallpaper, painting and watching him settle into his first home. Do we deserve it? No. He could be anywhere in the world. Instead…just healthy enough distance from us. Only a week ago my husband called me to the yard to see this piece of intricate work of art sitting atop a bush in the yard. I couldn’t believe it. How often do you have the chance to stand over the top of a bird nest? We’re usually standing under it observing it from afar. When we moved into our home a year ago we felt like we had moved into the middle of a bird sanctuary. So many different birds to watch, to listen to. But the detail that brought me the most JOY about the birds was finding multiple nests tucked away in carefully chosen safe places. As I stand looking down on this intricate work of art I am keenly aware of my Creator. I am in awe of His provisions. I read about those provisions, and I speak of them, but to gaze upon the detail of the work of God – NO words. Some days I get caught up in the details of this life I live and forget to notice what God is doing. Forget to remember that a day in His courts is better than a thousand elsewhere. I am drawn to His very presence standing over the beauty in the dwelling place the sparrow. Oh LORD, cause my heart and flesh to sing for JOY to you, my Living God. Help me, like the sparrow, to lay all I am and all I have at your altars. I look forward to tomorrow – to finding the JOY that you pour out for me each new day. A friend sent me this picture from Lowes today. Amazing what we can do with phones today. I felt like I was standing there with her. Thank you Debbie for making my day! She knows what these pitchers signify for me. The JOY of pouring our lives into another. Gods Word tells us time and again to tell the generations to come what we have seen, what we have learned, that they too might know that He is God. And might praise Him. One woman who is in her sixties pouring the truth of who God is in her life into a woman in her twenties and a woman in her fifties, who pours into women in their twenties and thirties and maybe even forties. Titus 2 gives us a clear directive for the older woman to teach the younger woman. The older woman (I like to refer to her as the more seasoned woman – in terms of years lived) does this best by simply living life with the younger woman in such a way that the values and character are lived out pointing to the very character of Christ Himself. This is NOT teaching from a podium. It’s life on life. The gospel meeting life circumstances. Changing us both along the way. Is someone pouring into your life in this way? Are you pouring into someone else’s life this way? It happens year after year. Yet somehow it’s like the first time every time for me. The excitement of watching the new growth of spring pop through the hard ground brings anticipation. All through the fall and winter I let go of the beauty. I miss it. It’s hard to remember and trust that though the stems are completely cut back, pruned, and nothing shows above the ground, that new growth will take place in due time. In God’s time. In times of lessons it feels as if there is no purpose. No work taking place within me. I become weary. He tells me to come to Him. To take his yoke upon me and learn from Him. Matthew 11:28. At times I’m tempted to question why i have to come back to this lesson again. Why cant I just get it? When I see the stems burst forth through the hard ground it reminds me of the work God is doing within me, when I don’t even know it. All things work together for good for those who love God and who are called according to His purposes. Romans 8:28. Even the times of pruning and pending darkness. God is working to bring glory to Himself. He can be trusted. I am reminded by the stalk of the soon coming Iris. I can’t wait to come back and share the glory of the full grown bushes in the peak of the season. God knows every high and low we face. All creation answers to Him. And I will take JOY today in the darkness of this most recent season, that brings forth evidence that He was at work all along. What do you need to trust Him with? This photo is one of my favorites. I keep it on my desk to remind me of the simple JOYS in life. When I need to sit back and take a break…I breathe it in. It refreshes me.